Extreme High Temperature Paint | Brushable & Aerosol | Superior Industries, Inc.
Zithron 900 Series extreme high temperature paints are superior quality, easy to apply coatings that were specially formulated for use in high temperature applications that call for dependable heat resistance up to 1235°F (653°C). Zithron 900 Series paints offer top of the line protection from rust and excellent resistance to chemicals. These are low smoking paints that exceed industry standards in this and many other performance areas. Zithron 900 Series paints are self-priming and are intended for use in normal indoor conditions. 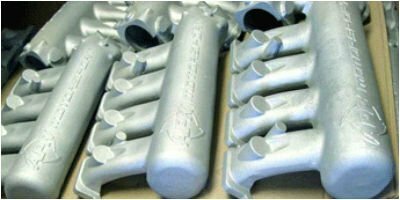 They are flame resistant and can withstand direct flame with normal performance up to 1235°F (653°C). Zithron 900 Series paints are ideal for use on wood stoves, fireplaces (gas, pellet, and wood), fireplace bricks, BBQ’s, venting systems (gas stove pipes and stove pipes), boilers and steam pipes, mufflers and silencers, industrial applications, commercial applications, craft applications, and anywhere else a high temperature paint is needed. Note: Zithron 900 Aerosol Series is available in “Clear”. 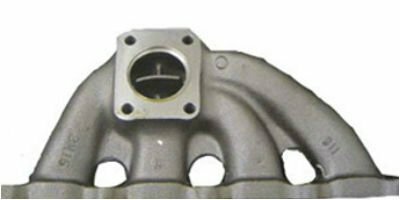 The clear versionis temperature resistant to 615°F. A high gloss finish can be achieved by applying up to 3 coats. Zithron 900 Series paints are fast drying and are available in both aerosol and brushable formulations; The aerosol paints come in 16 ounce cans (12 ounce net weight), and the brushable paint comes in quart size containers. There are 32 aerosol colors and 5 popular brushable colors to choose from. The coverage range is approximately 26 square feet per 16 ounce aerosol can and approximately 60-80 square feet per quart container. In order to cure properly, Zithron 900 Series paints require temperatures of 450°F (232°C) for 1 hour then 600°F (316°C) for 45 minutes. Zithron 900 Series High Temperature Brush-On Paint is a brush-on formulation of its popular cousin – the High Temperature Aerosol Paint. Use this handy paint to improve the look of your stove or barbeque and simultaneously ward off rust from steel surfaces. This paint maintains its color stability to extreme temperatures up to 1235°F (653°C). It is available in quart size cans and comes in 5 popular colors: Satin Black, Metallic Black, Charcoal, Metallic Brown, and Goldenfire Brown. This High Temperature Brush-On Paint can only be applied by brush; it is too heavy to be applied by spray equipment. 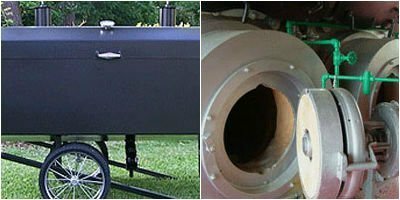 Make your gas firebox even more attractive and protect it for longer by giving it a coating of Zithron 900 Series High Temperature Paint. This paint was specifically created to handle even the harshest of elements that interior firebox surfaces experience. Although it is often the case that metals used within fireboxes form very difficult surfaces for coatings to adhere to, this Gas Appliance Fire Box Paint offers excellent adhesion to most substrates, having the ability to bond to surfaces that other paints can’t cling to. Zithron 900 Series Gas Appliance Fire Box Paint creates a hard finish that resists flames and provides excellent high temperature resistance, even when the coating comes into direct contact with flames. 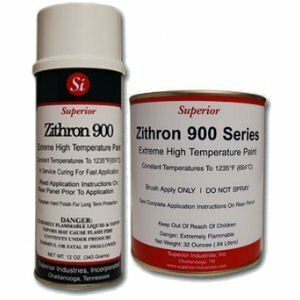 Zithron 900 Series High Temperature Aerosol Paint is created with a special formulation of heat resistant pigments blended into a silicone polymer resin. The result of this special blend is reliable film integrity and a finish that is scratch-resistant. This silicone formula can handle working temperatures up to 1235°F (653°C), providing superb color retention even as the heat becomes extreme. Zithron 900 Series High Temperature Aerosol Paint cures rapidly and provides great results when applied over ferrous metal surfaces. 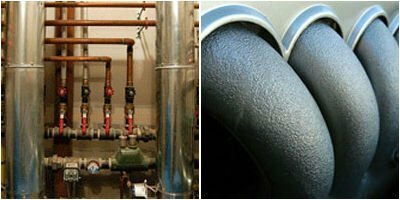 Offering superior working properties, Zithron 900 Series High Temperature Aerosol Paint is ideally suited for application to stoves (gas, wood, or pellet) and stove pipes, engines and engine manifolds, and other metal surfaces that experience high temperatures. This paint is available in numerous popular colors to meet the needs of our customers and is packaged in 16 ounce cans (12 ounce net weight). 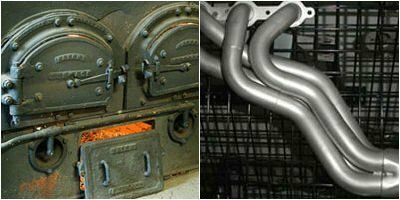 Because they offer easy application, an excellent cured finish, and great coverage, aerosol cans are the packaging type most preferred by professional fireplace installers and heating stove installers. That said, for applications where aerosols are not preferable, Zithron 900 Series also offers a brush-on formulation for added convenience. Restore the appearance of your Bar-B-Q grill and add a layer of protection with Zithron 900 Series Bar-B-Q Paint. This Bar-B-Q Paint has been formulated specially for outdoor BBQ’s and does not give in to blistering and peeling – even at temperatures up to 1235°F (653°C). Because it is intended for exterior use, this spray paint is self-priming. It has blended with an epoxy additive that serves to oppose vegetable oil and animal fat. Zithron 900 Series Bar-B-Q Paint is easy to apply to metal surfaces and is available in 16 ounce aerosol cans (12 ounce net weight). Some of these colors are metallic, and that, when cured, the metallic paints show a slight gloss due to the metallic particles. Although these paints appear glossy when applied, for all practical purposes, they have a flat finish after curing. 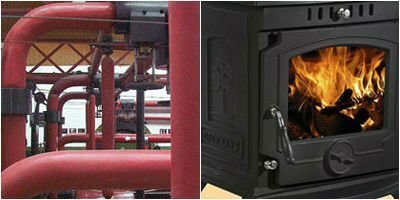 Note that many fireboxes are created from materials, or are coated in a layer of aluminum for protection from rust, that cannot withstand direct flames up to 1000°F (538°C). If the metal substrate beneath Zithron 900 Series paint fails, the paint will not be able to hold together the deteriorating metal. In this scenario, it may appear that the paint itself is failing due to a flaking or bubbling appearance.